We are just back from a funeral, Pamela Goddard, who worked at the pottery from 1948 until she took early retirement in 1984, died at the beginning of June. 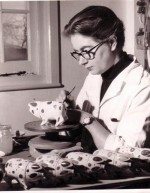 Pam was taken on by Jack and Wally Cole to help with decorating the ever increasing range of pottery they were developing in the early post-war years. The country had been starved of pretty things, but now as long as the pottery was for export they could put patterns everywhere! The home market was still restricted to decoration which only used different coloured clay slips, but export allowed total freedom of expression.Pam worked on the Cottage stripes and all their variations and was involved in the introduction of the very popular Multi floral range of tableware (click here fore more), which was exported both to the United States and to several Northern European countries throughout the 1960’s and 70’s. From the mid 60’s Pam moved from painting to throwing ware and, as more semi-automatic tableware making machinery was introduced, she concentrated mainly on thrown dishes, bowls and jugs. Her thrown ware is identified by the pressed metal P on the base of her pots, identifying her painted work is more of a problem as Rye Pottery standard ware were patterns that were copied from a master original and pieces were not signed until the initialling of each piece was introduced by the younger Coles in the mid 1990’s. Hard to believe half the year has gone and we are now running downhill until December. We seem to have one, or if we are amazingly lucky two,fine days followed by enoromously damaging winds and rain. A poor friend who runs a local nursery said after a while their customers just give up on gardening and decide to leave it all until next year. We are so lucky that pottery does not go off or turn brown in the wet and wind, and we have seen a lot of our regular summer visitors from overseas, though they won’t be having much fun looking at the gardens on the Kent and Sussex borders, in particular Great Dixter and Sissinghurst, both of which make great outings when spending a few days in Rye. 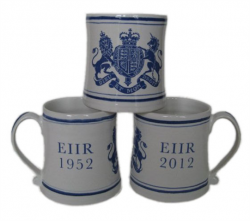 So the Jubilee weekend is over but we are still receiving orders for our mugs so that should keep us busy for a while yet. Everyone seemed to enjoy themselves despite the weather or maybe, like true Brits, because of the weather! I was interested to hear another firm – interviewed on Radio Sussex on the same morning as we were – remark on the expense of trying to do anything to mark the Olympics. Like us they had decided NOT to risk any production that could possibly bring the power and wrath of the Olympic committee down upon their rather small and unprotected heads. We think we will not even draw attention to ourselves by continuing to fly the Union Jack after this week; luckily the sporting figures that we do make, are not exactly hugely popular Olympic sports anyhow. So we can safely have a window of our Rye Pottery Golfers and Cricketers with no danger of a writ, I might even include the Rye Gardeners or the Rye Chef as so far I have not heard that either gardening or cooking are included in the 2012 line-up! Hot on the heels of Biddy’s appearance in the Mail on Sunday, a great piece about our Royal Jubilee Commemorative pieces in our supportive local paper – The Rye and Battle Observer. 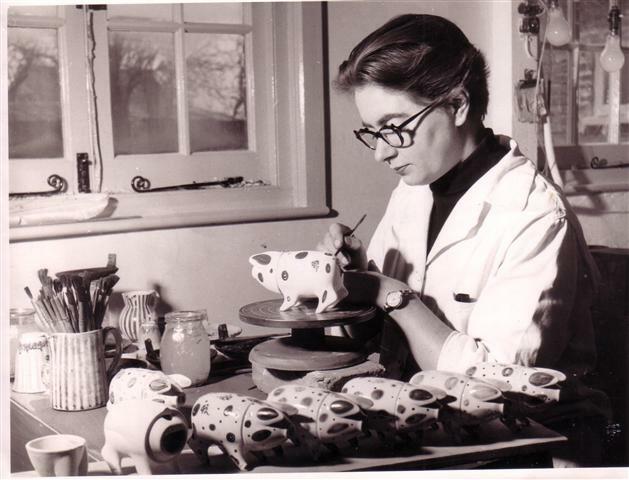 Biddy Cole, from Rye Pottery, said: “One long-established local family recently came to buy Rye Pottery’s Diamond Jubilee mugs for their grandchildren, because they had such fond memories of their own children being given Rye Pottery Silver Jubilee tankards while attending Rye’s primary school back in 1977. “It was a wonderful symbol of support for both the Diamond Jubilee and our long-standing local manufacturing business, and particularly so in the current economic climate. >> Click here to read the whole article and to find out all the latest local news!